This bright apartment located in Barcelona, Spain, was designed in 2016 by Susanna Cots. Finding equilibrium in the frenetic pace of the city; extracting the natural light and brilliance from one of the metropolis? most singular districts; only revealing what you want to show; beating the daily stress hands down: this is the tranquillity that the interior architect Susanna Cots has managed to transmit with her new Urban White design. 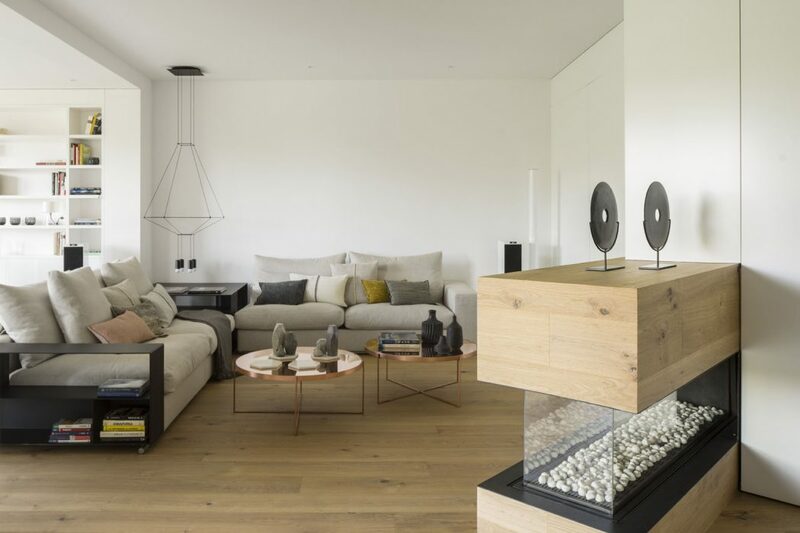 The owners of this home located in the high part of Barcelona wanted a haven of tranquillity and at the same time to be able to enjoy one of the best views of the city. The interior architect Susanna Cots has designed a space in 180 m2 that satisfies both desires, especially with the ingenious visual integration of interior and exterior that creates a unique atmosphere in the common zones. The key element that makes this interior-exterior union so special is an outside fireplace outlined by a black frame that encompasses the outside patio and joins it visually to the living room, merging the two spaces through a glass door by Vitrocsa that, fully open, creates a generous common area.